In the mega-competitive hotel industry, it’s often difficult to differentiate brands. Plush pillows, flat-screen TVs and continental breakfast— they all basically offer the same things, right? 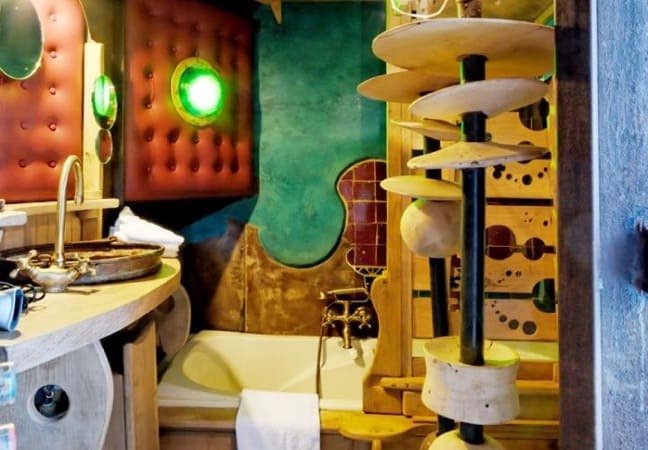 But the envelope-pushing minds behind the Most Unusual Hotels In The World are a horse of a decidedly different feather. Though each establishment stands out in its own way (Salt beds, ice beds and underwater beds, oh my! ), every one of these unforgettable establishments shares something in common—there’s absolutely nothing common about them. Japan has its own version of capsules, but they’re more like astronaut pods. These peculiar-looking modules look like they come right from a James Bond movie. Well, technically, the capsules come from offshore drilling sites, but they sure look like Goldfinger props to us. Things are pretty modest inside the oblong sleeping quarters, but should you upgrade to the top package, you’ll find a toilet, sheepskins and a DVD player with (what else?) a catalog of 007 movies. Unlike the majority of hotels around the globe, Das Park doesn’t have a set price for a night’s stay. Then again, seeing as how the Austrian rest haven (there’s also a new one in Germany) is absolutely nothing like other hotels around the globe, it all makes sense. If you slept in one of their repurposed drainpipes, you wouldn’t leave money because of lavish amenities. The modest rooms have a bed, a blanket, a light and, maybe, directions to the bathroom at a neighboring public space. What you will happily pay for, however, is the ingenuity and courage it took to create this masterpiece of minimalism. Though similar projects are annually erected in places like Quebec and Finland, all of them are mere chips off this old ice block. What started as an exhibit from Japanese artists in the early ’90s has become a must-visit for world travelers. 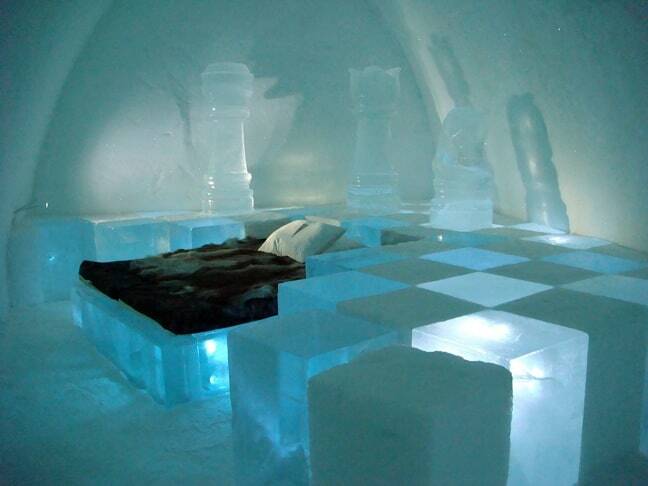 Most who visit the Swedish landmark are in awe of the craftsmanship it takes to construct an 18,000-square feet facility completely from ice and snow. All who haven’t visited are still trying to wrap their heads around the idea of sleeping atop a freezer disguised as a bed. And you though the United States had an obsession with salt? Ha! Venture down to Bolivia (specifically the Salar de Uyuni area), and we assure you that you’ll find more salt than the USDA would ever know what to do with. Instead of seasoning in the kitchen, the mineral is used for the actual kitchen, roof, floor and just about everything else in one of the most unusual hotels on the planet. While licking the walls is forbidden at the Palacio, sitting in a chair made of salt and taking a dip in the saltwater pool is highly encouraged. For a hotel to offer natural wildlife scenes from a bedroom window is an inviting amenity, but not an altogether original one. Still, this premiere ecotourism stop makes the list because of the unbelievable views it provides. Stretching some 115 feet into the Soberania National Park skies, the tower literally puts birdwatchers and howler monkey lovers at eye level with the captivating creatures. 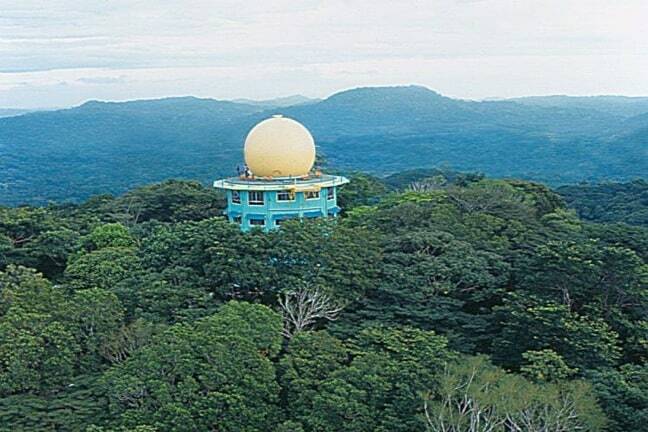 Should you conjure up the energy to put on a robe and shoes and go up to the observation deck, the images of the surrounding forest canopy become truly breathtaking. Trekkers have hiked Patagonia– the mountainous region between Argentina and Chile– for hundreds of years. Still, we’d be willing to bet that very few have rested in surroundings quite as posh as those at EcoCampers. Promoted as sustainable opulence in the middle of the outdoors, the superior geodesic domes come with a bed, propane heater and fully equipped bathroom. If you want to take your post-hike downtime to the next luxurious level, splurge on a 300-foot dome suite. 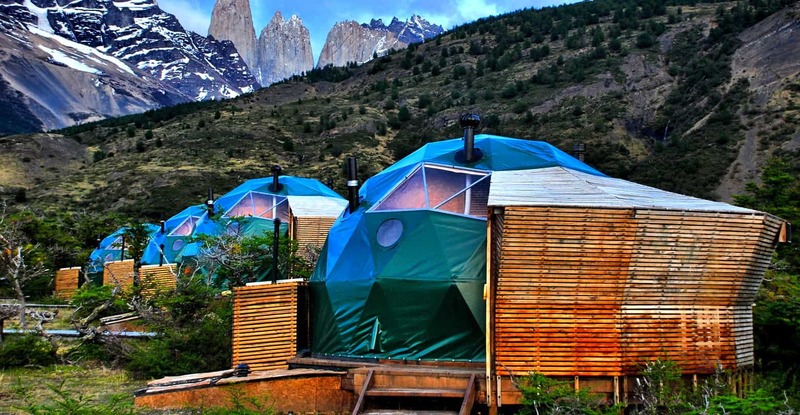 Fashioned after indigenous tribal dwellings, these prime quarters have a wood-burning stove and open terrace to catch the occasional guanaco encounter. Despite its name, this sanctuary is known more for its screensaver-worthy views of Kenya’s Great Rift Valley than its hippo sightings. The Hippo House, and its seven stately bedrooms, provides the main accommodations. Dodo’s Tower, and its nine stories of understated elegance, supplies the wow. The 360° views are majestic. The hint of British décor blends with the natural ambiance wonderfully. Organically farmed veggies and Indian Ocean-sourced seafood are the basis of the four-star cuisine. The fact that giraffes and zebra breeze by as you savor it all makes Hippo Point magical. Southern Chile’s Huilo-Huilo Biological Reserve has over 230 square miles of unrivaled sights and attractions. But even the continent’s largest zip lining system and the world’s smallest deer take a back seat to Magic Mountain. Like something out of Peter Jackson’s wildest dream, this jaw-dropping destination awes guests in every respect. Inside, 13 subtly decorated rooms let the flora and fauna do most of the work. As for the exterior gasps, they come courtesy of a waterfall cascading from the roof. Most people who believe in Atlantis say the ancient city rests somewhere deep in the Atlantic Ocean. But if they ever make their way to Fiji, they’ll find the closest thing to it in modern times. 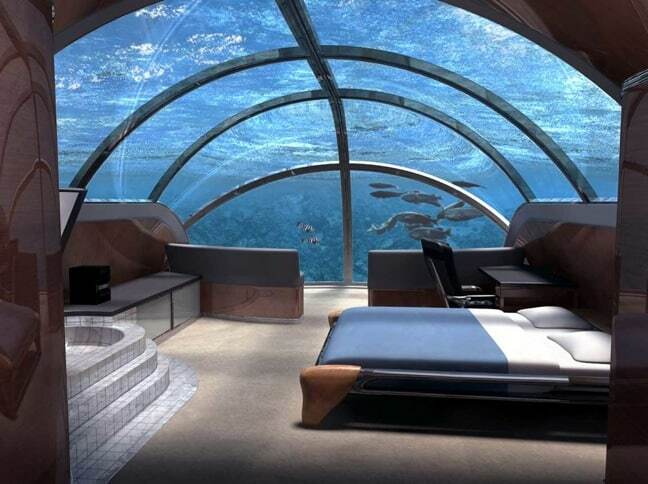 Poseidon, the extravagant conception of L. Bruce Jones, intends on being the only place in the world where a person can spend the night 40 feet underwater in luxurious fashion. Set to open in late 2012, the 24-room resort will work on a six-night-stay plan (two underwater, four in a traditional resort or bungalow). Ready to make your reservation? Well, Poseidon sure makes a splash with its cost– $30,000 per couple.